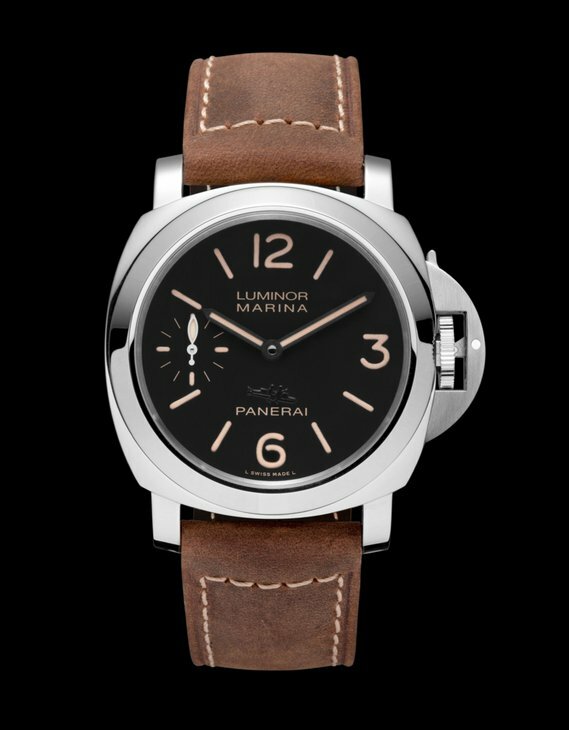 The special edition PAM 468 Luminor Marina timepiece will be exhibited inside Panerai’s boutique, surrounded by classic Italian-style atmosphere, much like the Italian boutique via Montenapolene in Milan which opened earlier this year. Everything about the structural design and atmosphere of the boutique has been carefully constructed to recall the world of the sea with it simple lines alternate with wave-like structures and use of materials derived from glass, white marble, steel and specially-treated teak, most of which were imported from Italy. 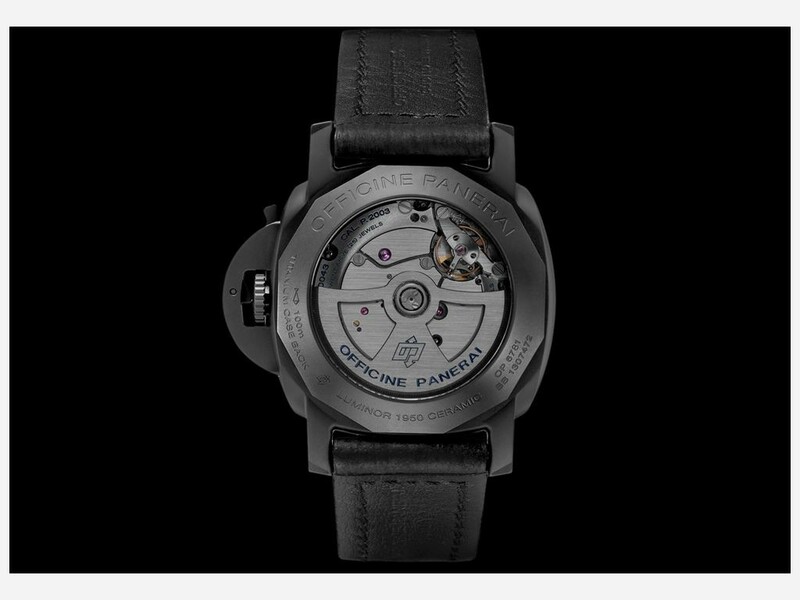 The Bal Habour Boutique will offer select limited edition watches, with a particular focus on models fitted with movements which are exclusively manufactured by Officine Panerai. 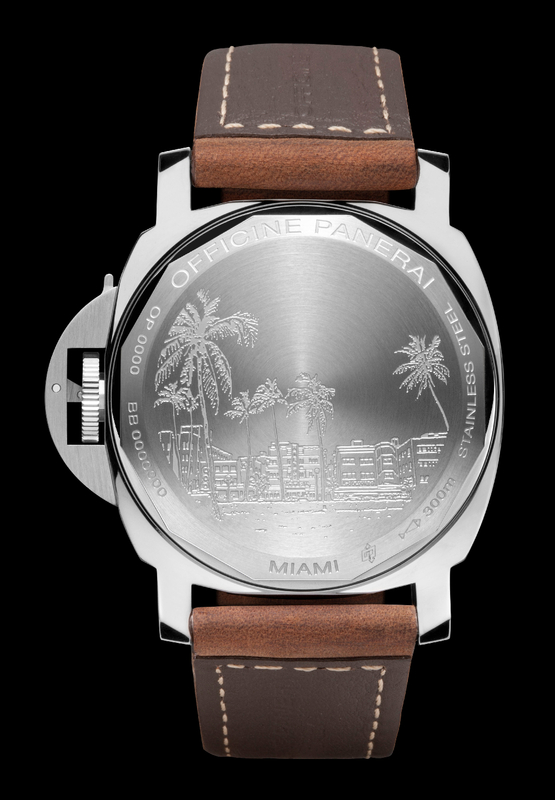 One such exclusive and special edition timepiece designed for Bal Harbour Boutique is its PAM 468 Luminor Marina ‘Bal Harbour’ watch. Antigua will celebrate with a procession of events recognizing Eilean’s restoration and return to the island, where she had been a prime contender for almost 30 years. At the close of the Antigua Classic Yacht Regatta Eilean will set sail to Europe where the Panerai Classic Yachts Challenge (PCYC) will pick up, as has been the tradition. 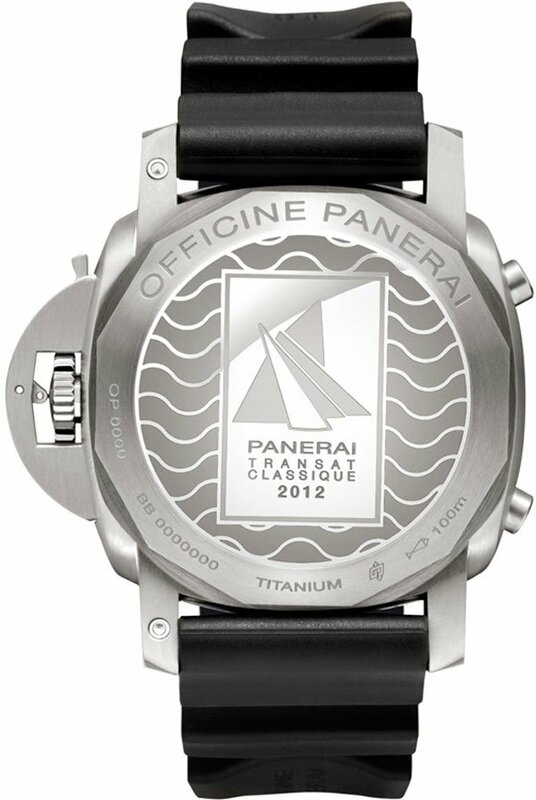 The PCYC Mediterranean Circuit will then commence from June to September with focus given to August and September in the United States East Coast waters of the PCYC North American Circuit, appointment of Marblehead, Nantucket and Newport; which makes for an extremely busy social calendar for Officine Panerai. 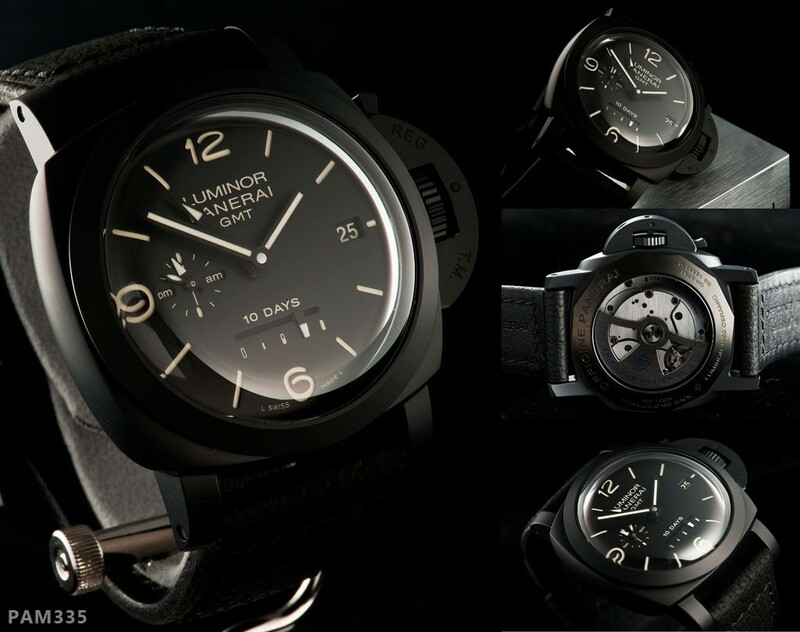 All this and Officine Panerai has recapitalized on its vintage watch designs, the Panerai Luminor Marina 1950 3 Days and the Luminor 1950 3 Days Power Reserve. Both models are handsomely designed with 47 mm stainless steel diameter cases having the Panerai signature winding crown protected by the brushed steel lever device. The dials are black with see-through sapphire crystal case backs with natural leather wrist straps. 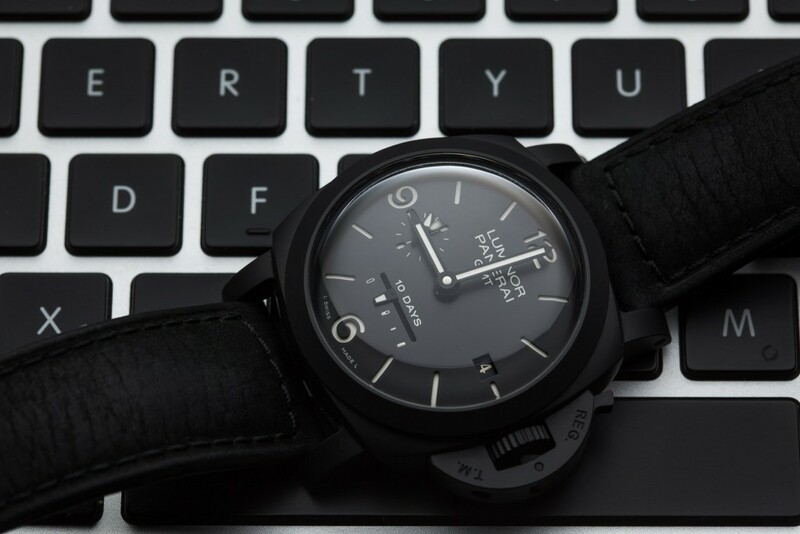 Both timepieces are in Officine Panerai’s Historic Collection and both are reflective of Officine Panerai’s historical transition from the 1936 Radiomir design to the 1940 Luminor design. Both equally attractive and masculine. This year’s Salon International de la Haute Horlogerie (SIHH) saw the release of Officine Panerai‘s Luminor 1950 Tourbillon GMT Ceramica, a model truly to be reckoned with. The brand’s newest creation combines Panerai’s trademark tourbillon mechanism with a dual time display, a mix of unrivaled sophistication and innovation. The tourbillon is a part of a watch escapement that counteracts the effects of gravity, invented by Abraham-Louis Breguet in 1795. Watches with this feature mount the escapement in a “carriage” or rotating frame that turns 360 degrees at regular intervals, reducing gravitational error. At the time that Breguet finalized his invention, most watches were pocket watches and thus were almost always in one position. The effect of gravity on these timepieces was especially conspicuous, so to offset adverse changes Breguet provided the perfect solution. 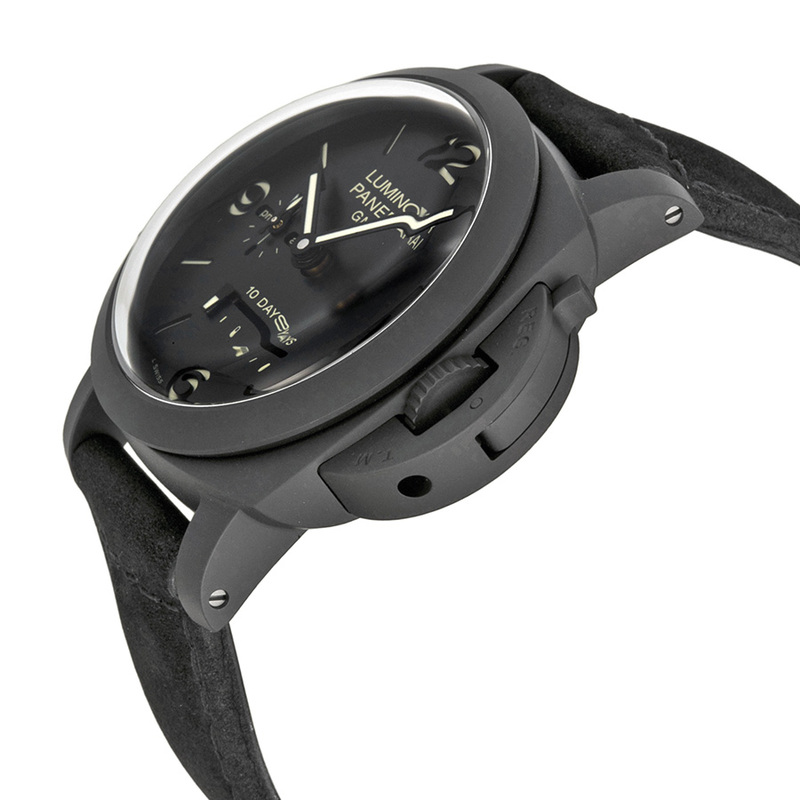 The Luminor 1950 has a personalized Panerai leather strap and an adjustable buckle made of steel. The 48 mm diameter case is made of synthetic ceramic with a zirconium powder base, showcasing the adept skill of Panerai’s manufacturing. The processes undergone to achieve the final model’s matte black color are particularly complex and thoroughly ensure resistance to corrosive agents, high temperatures and scratches. 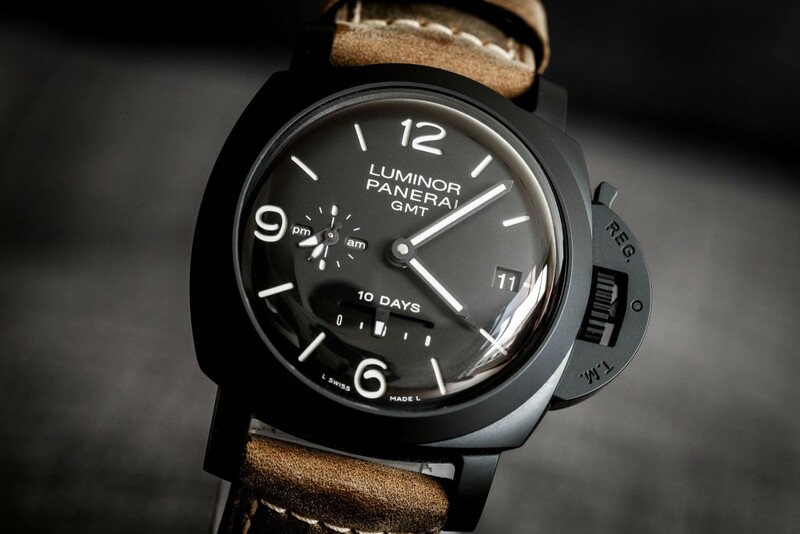 The Luminor 1950 functions by the Panerai P.2005 movement, which produces 28,000 vph and exhibits a six day power reserve, thanks to a three series-connected spring barrels. The 12-sided titanium back displays a centered window of sapphire crystal so that one can glimpse at the P.2005 mechanism in action. 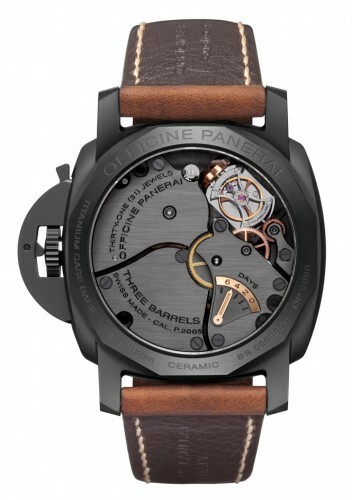 This is the first time a Panerai model has had the P.2005 B version built in, which is essentially a blackened version of the traditional movement. 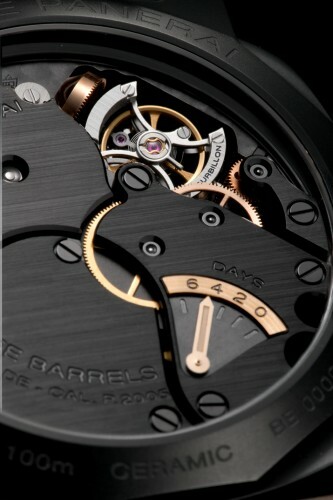 Panerai’s patented tourbillon mechanism has the balance rotate on its axis every 30 seconds. 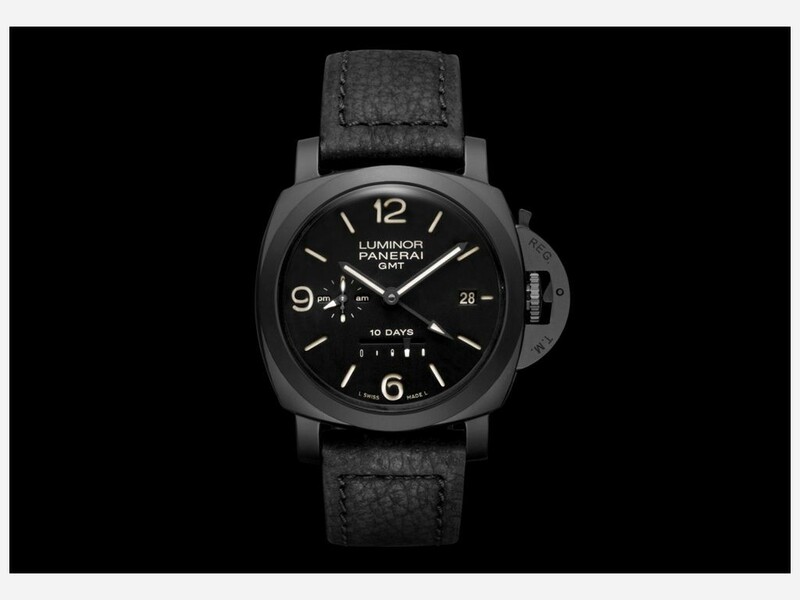 The black dial lends more to the Luminor 1950’s theme of graphic simplicity, with Panerai’s original sandwich structure to help provide for maximum visibility even under very dim lighting conditions. At 3 o’clock, the small dial indicates the time over 24 hours as well as am or pm. The dial at 9 o’clock connects to the tourbillon and moves twice as fast as the second hand, thus deemed the small seconds dial. It consists of multiple dot markers and completes one revolution in half a minute. 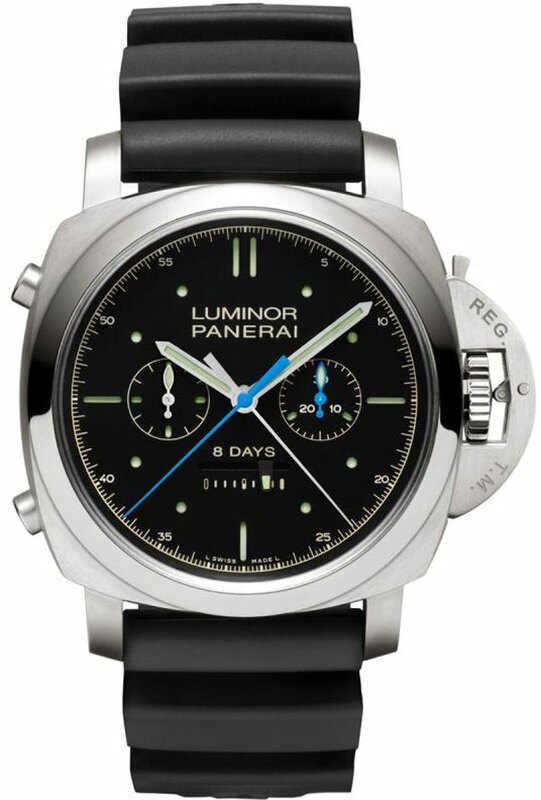 This dual time concept is a Panerai method implemented in many models. Combined with the tourbillon, the Luminor 1950 reinforces at once both tradition and modernism.